Doncaster RLFC boss Gary Thornton won’t be doing old club Batley Bulldogs, who still need a couple of wins to be certain of avoiding the drop, any favours in tomorrow’s Championship Shield clash at the Keepmoat Stadium (2pm). 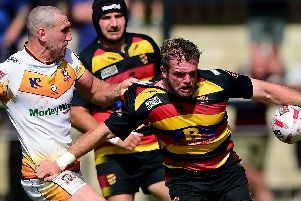 Although the club’s fate was sealed following last weekend’s spirited defeat against Featherstone, Thornton has not thrown the towel in and wants to amass as many points as possible in the final five games. “I want to get some more wins under our belt,” he said. “It’s a difficult situation, and the players will need to motivate themselves, but I don’t want us to go out with a wimper. The Dons will be without scrum-half Paul Mennell for the rest of the campaign, though his knee injury isn’t as bad as first feared. Thornton will make a late decision on who partners Joe McLocklan at half-back. Thornton, meanwhile, is hoping that scrum-half Richard Wilkinson, whose rehab is going well, will be fit for the last three games. Second-rower Brad Foster (shoulder) is ‘50-50’ but big prop Brett Waller is available. John Kear’s side, who completed a league double over the Dons will be without full-back Johnny Campbell – a player Thornton signed for the club during his time at Batley – following a serious leg injury last week. “He formed part of an impressive back-three when we played them at Batley last month,” said Thornton.